UK based research chemical vendor RC NET Chemicals is part of our Trusted Vendors program which means they have consistently delivered high quality products and provided excellent customer service, however what is it actually like to order from them? Once arriving on their site you are greeted with an easy on the eye layout with a revolving feature area in the middle that displays their special offers. Have a look through the slides as on the day ordered there was a promotion for 20% off all orders if you used the discount code “RCNET20” when checking out. 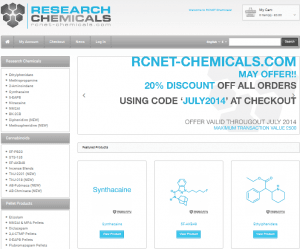 RCNET Chemicals has a easy to use website. Navigating their websites 40 plus products is easy thanks to their very smart navigation bar which quickly displays their products along with its chemical structure without any lag. A quantity of AB-CHMINACA was added to our shopping and check-out began. The process is simple and you do not even need to register for an account – although registering to their SSL secured site would allow you to log in at a later date and view your ordering history. Paying on RCNET is like using any mainstream shopping site as most credit & debit cards are accepted as well as bank transfers. We chose bank transfer and after completing the order we sent payment around 2pm. Once the order was placed a confirmation email was received followed by another email around 3.40pm confirming that our payment was received and the order had been dispatched. The next day discreet brown jiffy mailer was received and inside inside was a heat sealed foil bag which contained the properly labelled and accurately weighed AB-CHMINACA along with samples of their AB-CHMINACA blend, Deschloroetizolam 6mg pellets, MMB-CHMINACA and Methoxphenidine. 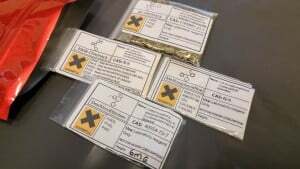 The AB-CHMINACA was an off-white powder similar to what is supplied by other top research chemical vendors, however starting at £9 per gram RCNET is most likely the cheapest. Overall ordering from RCNET Chemicals was a breeze and although they have low prices their products are not low quality. Since ordering we have been informed via their newsletter that they are now stocking three new products; AMB-FUBINACA, FUB-AKB48 and MAB-CHMINACA.